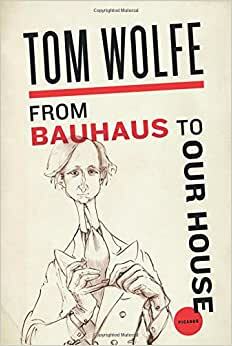 Tom Wolfe, "America's most skillful satirist" (The Atlantic Monthly), examines the strange saga of American architecture in this sequel to The Painted Word, From Bauhaus to Our House. 2.0 out of 5 starsFrom Bauhaus to Tom's Outhouse. This is a very disappointing book. It is largely a tirade against Modernism and architects and social-political movements. But it does not go anywhere in the end. You know what he does not like - and Tom did not like a lot of things - but not what he likes or what he thinks we should like. Yes there was a lot of bad Modernist architecture. But there has always been a lot of bad architecture of all types since the time that humans first built buildings. And despite the title, Wolfe never really addresses the topic of "our house". You can't blame the post WW2 flood of ugly houses on Bauhaus. I live in Miami. People come to see our "Art Deco" and "Miami Modern" architecture which is much inspired by Bauhaus. Today there is a building boom in housing in Miami that is strongly inspired by Bauhaus design - simple, uncluttered, harmonious but with aspects that attract the eye. What a blessed change from McMansions. This is not a book about architecture. It is a book about Tom Wolfe. One aspect that really annoyed me about this book was that Wolfe really is annoyed to an obsessive degree by people with large egos. And yet the ego that really stands out in this book is Tom Wolfe's. It is significant that Wolfe always wore a white suit to make sure that you don't miss him standing there in the crowd - the white flag of ego, on legs. Read this after “The Right Stuff” because I really liked that book and was looking for an architectural history book. For someone familiar with the subject matter in this book I can understand the low reviews, but this was a very entertaining way to learn about the progression of architecture in the twentieth century. I look forward to reading more nuanced descriptions of this history, but I also really enjoyed reading a version from someone who wasn’t afraid to call modern architecture stupid and ugly. Beyond architecture the book is an illuminating account of how academia can create utter garbage when it turns completely inward, rather than using intellect to pursue societal goals. I studied Architecture in the early 60's when the theories described here were in "full bloom". It has taken us a long time to get past stoicism in architecture. As always Tom Wolfe's is funny and entertaining when he delivers his observations on life. Thank you Tom! Very funny and informative. I am a cabinet maker and regularly have to watch clients suffer through the nonsense he describes here from architects and designers. I found it fascinating to find out the historical origins. The book looked new. It arrived more quickly than I expected from a private vendor, in a well protected envelope. A good price, even with the extra shipping charges. And in interesting book if you're interested in how America went from Beau-Arts buildings (quoin block corners, arched windows, ornamentation and peaked roofs with overhangs to shed rain) to the flat-roof, shear façade, 'modern' (dull) buildings of today. I've seen it everywhere...A beautiful Romanesque Church with an extension that looks like it could be a municipal parking garage or a nail factory. Ugh!